There are more than 15 different oil water separator technology types that can be used to treat oily water. And within each technology type there are small design differences between vendors. It can get confusing! This page has been put together so that you can better appreciate important design factors and how they affect each oil water separator type. The information is in the form of a series of ‘tutorials’. We hope you find them helpful and interesting. Make sure you let us know what you think. It surprises many to learn that oil can pollute water in several different ways. Understanding the different types of contamination is vital in order to determine what methodology of oil water interceptor will be effective. Typically, there are four main types of oil pollution. Large oil droplets typically more than 150 micron. Cannot be removed with gravity or plate packs; in fact they may make the problem worse! Give us a call or send an email. Using our extensive data base of customers oil water pollution types we can put you in the picture in no time! In addition take advantage of our extensive oily water test facilities and laboratory. We are are able to analyse and characterise your oily water problem and give you a full report. In many cases we can do this for free! Why is Oil Droplet Size so important? All oily water separators are designed to treat a particular range of micron size of oil droplets – this is called the micron rating of the separator – or micron separator range. 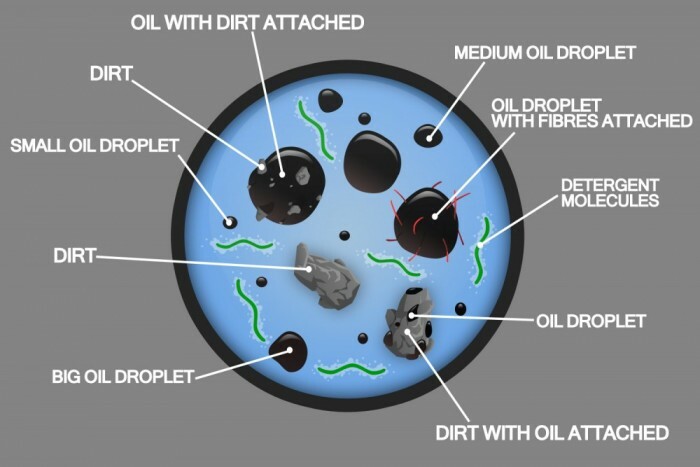 Some oil separators wont be able to treat oil droplets that are small (eg Gravity, Coalescing Plate Packs, VGS, European EN-858 Tanks) and some oil water interceptors are not able to treat large oil droplets (e.g. Media filters, DAF and Chemical Treatment systems). A 150 micron rated separator will separate oil droplets 150 micron and larger, but not separate 25 micron droplets – those oil droplets will still be in the water and get discharged with your “treated” water. This is why oil droplet size, and oil droplet size distribution, is one of the most important factors in determining the oil water separation performance of all mechanical separators. 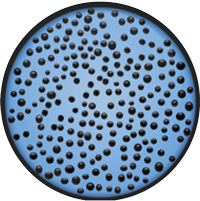 Oil droplets in water are never one size, but present in a size distribution, with some smaller and some larger. For the more technical inclined we find in most applications the oil droplet size distribution is a log / normal shape distribution. Oil droplet size and the oil droplet size distributions must be measured on site with ‘live’ flowing water. You cannot sample your water and send it to a laboratory because the oil droplet size with change very quickly after sampling and the results from the laboratory will be meaningless. Oil droplet size can be measured on site by a skilled technician with the required equipment. Its is not difficult when you know how but it is a highly specialised area of water analysis; so don’t expect a ‘normal’ laboratory to have the required expertise or equipment. We have many years experience and have the expertise and calibrated equipment, so if you need help let us know. 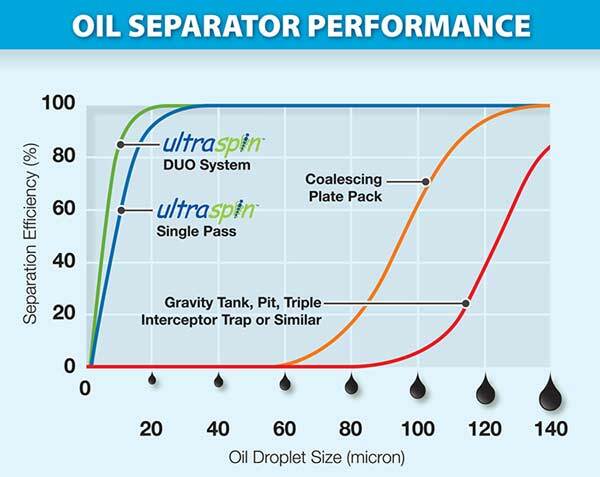 Ultraspin has several oil droplet particle size measuring tools. 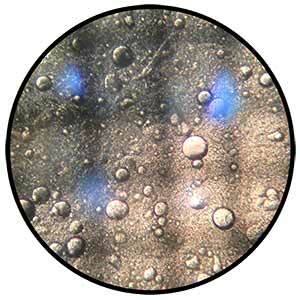 The most accurate technology available for measuring droplet size is a video particle analyser. Ultraspin has a portable video particle analyser and skilled operators who can bring it to site to measure your oil droplet size and distribution. It is vital to have both an accurate oil droplet measuring tool capable of telling the difference between oil droplets, air bubbles and suspended solids AND a skilled operator experienced in oily water analysis. Ultraspin has the best of both! So if you would like our help please let us know. There is no more guesswork required. There are a couple of ways to estimate your oil droplet size. They are not as accurate as direct measurement described above but should give you a rough idea. 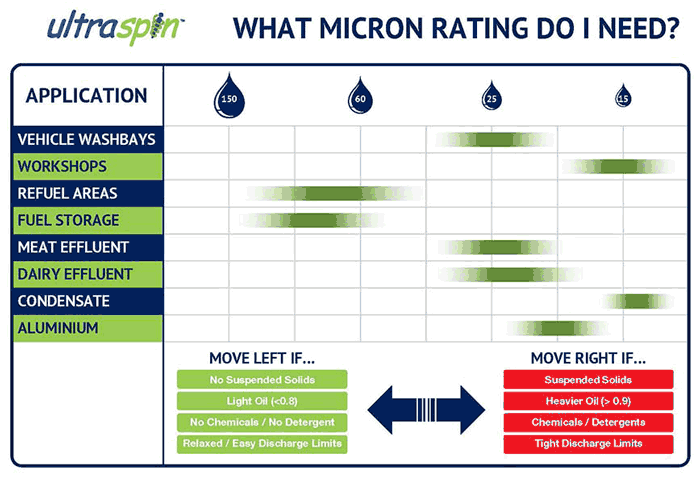 The Ultraspin table below can give you a guide based on “typical” oily water situations. The presence of suspended solids, additives, detergents or surfactants will change your droplet size to be larger or smaller, so you should account for this if they’re in your water. You can also get a rough idea of your oil droplet size with a visual inspection of your sample. In general, if you can see the droplets with the naked eye, they are large, say 150 micron plus. If the water looks hazy, white or milky, the droplets are very small (less than 25 microns, often less than 10 micron). We have a data base of sample photos from thousands of applications with matching droplet sizes to give you a visual guide. Look for a sample that has similar characteristics to yours. If you need help, email us a photo of your sample and our oily water engineers will help you. 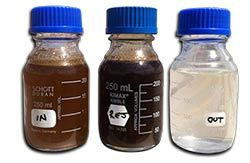 Now that you understand the 4 types of oil contamination – and the importance of oil droplet size – you can begin to appreciate how different types of oil separator will work under different oily water feed conditions. For example all types of oil water separators are rated to treat a particular range of oil droplet sizes. You can narrow down your choice of oil separator technologies that suit your application based on what droplet size each separator technology is designed to treat. More powerful separators have a number of advantages including obtaining better quality discharge water, meet or exceed Local and National Trade Waste discharge standards, meet or exceed future discharge standards, deal with accidental oil spills, tolerate higher strength non-“quick-break” detergents and cleaners. Oil Water separation efficiency can be objectively accessed by examining the separator oil droplet size vs. separation efficiency curves. For higher quality separators these curves should be readily available from manufacturers. Manufacturers should also be able to confirm performance to these curves by independent testing. The purpose of oily water separators is to obtain clean water. However, claims of a separator being able to achieve less than 10 mg/l discharge are meaningless and deceptive without recourse to oil droplet size performance curves. Caution: There are oily water vendors who can’t measure the oil droplet size as they don’t own the specialised equipment required. You should not trust vendors who can’t measure oil droplet size. They can only guess how their equipment will work in your application. It’s like a pressure vessel manufacturer not being able to measure pressure, or an oven manufacturer not being able to measure temperature. It’s ridiculous – but it happens! Always ask your supplier for an objective oil droplet based performance curve like the one shown here. Make sure its one they have generated by measuring oil droplet size on their equipment, and not copied from another vendor like Ultraspin. Compare the curve to the oil droplet size you have or need. 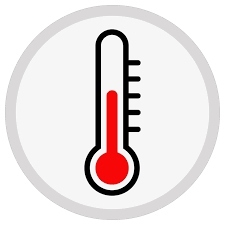 If a supplier can’t or won’t send you their own performance curve – be very wary! Mean oil droplets size is the single most important factor for defining the dirty oil water, but there are several other factors that are also important. The viscosity of the water falls as the water temperature rises. This allows oil droplets to move more easily through the water phase, thereby producing better oil separation with many oil water separators (but not all). Therefore, increased temperature improves separation efficiency for most oily water separators. The Ultraspin separator can be supplied to operate within the temperature range 0 to 120°C (32 to 248°F), at higher temperatures special materials may be required. These types of separator may require water coolers to work effectively. For many oil water separators the oil removal efficiency is dependent on the difference in density between the contaminant and the water. The separation efficiency increases as the difference in density increases. The density difference can increase if you have lighter oils or your water is salty, or both. Typical densities for Oil are 950 to 750 kg/m3 (0.034 to 0.027 lb/in3) and water : 1050 to 995 kg/m3. (0.038 to 0.036 lb/in3). Some types of oil water separator are NOT well suited to high oil feed concentrations and high feed oil concentrations overload or block the systems. For these types of system careful pre-treatment to remove oil will be required. Coalescing plate packs (max 1% oil or 10,000 mg/l). With high oil concentration for this type of separator the plates become coated in oil and sludge. This requires the plates to be removed and cleaning to restore oil removal efficiency. There are many different types of oily water separators on the market. Each type has its own unique design factors that determine how well it will work. It is beyond the scope of this tutorial to list and explain all these factors but some general help is listed. Please note: Oil skimmers, rope and belt skimmers and similar are not considered as they do NOT treat the water but merely remove some of the floating oil. Wetted Plate area: Lower cost but don’t work as well. Mean Plate spacing: Closely packed plates (about 10mm) work better but are prone to blockages. Shape of plates. Complex shapes may be very difficult to clean. Plate material. Some materials are low cost but will warp and degrade in the sun or when exposed to hydrocarbons. Simply allowing oil to float to a surface via gravity is a simple way to remove easily separable oil droplets that are about 150 microns or more. Examples of this technology include API separators, triple Interceptors, above-ground tanks or collection pits. Project plan area of settling tank. Oil removal / skimmer design. Ultraspin engineers were the designers of the world’s first commercially successful oil removal hydrocyclones. One of the keys to our successful designs is the use of optimum geometric ratios, such as separator length, diameter, orifice sizes and taper angles to achieve maximum separation. By comparison with conventional solids removal hydrocyclones, our designs are very long and generate high centrifugal separation forces. Hydrocyclone nominal size: Larger hydrocyclones are lower cost but don’t work as well. Separator Swirl Number: Higher swirls can increase efficiency but may emulsify the oil. How oily water separators are operated will effect the way they perform. Some of the important operational factors that effect oily water separators are discussed below. Many oily water separators, such as the plate pack type, require regular cleaning and maintenance to continue functioning. It is important for customers to fully understand what is involved to keep these technologies operating before committing to a purchase. Read the full installation and operating manuals from the vendors. They can sometimes be downloaded from the internet. Speak to actual users of the equipment. Note: Some plate packs contain only a 20L oil drum. This often fills and overflows, creating a mess and non- compliance with discharge. Ultraspin supplies a 500L oil drum as a minimum to avoid these problems. For most conventional oily water separators, like plate packs, the separation efficiency reduces as the flow increases. But for the Ultraspin system it is the opposite! Increased flow increases the strength of the centrifugal forces, increasing the oil separation force. The ‘reject ratio’ is the ratio of the oily reject stream leaving the Ultraspin separator to the inlet of feed flow rate of fluid to the separator. This is an important parameter in the operation of the separator. Typical reject ratios are from 1 to 20% subject to design requirements. A minimum reject ratio exists for separator efficiency – below that and it will be impaired. It depends on the size of the reject orifice. A high reject ratio does not affect the performance of the separator, but leads to excess water in the separated oil reject and can result in unnecessary re circulation of the water. Hence, the optimum reject ratio is just above the minimum reject ratio. The reject ratio is usually set by Ultraspin design engineers and should not require any further adjustment by clients. A proven method of increasing the power of separation of the Ultraspin separator is to recycle part or all of the treated underflow back to the inlet for further treatment. This is a feature unique to Ultraspin separators. In this way very small oil droplets that missed being separated in the first pass have a second chance at being recovered in the second pass. This can greatly improve separation efficiency with emulsified oily water mixtures. One pass (no recycle): 85% of 20-micron droplets will be removed. Two passes (or 50% underflow recycle): 98% of 20-micron droplets will be removed.